When you pick up a Visit Buffalo Niagara brochure at the airport, along with places like Frank Lloyd Wright’s Darwin Martin House and the Albright Knox Gallery, Five Points Bakery on the list of places to go. 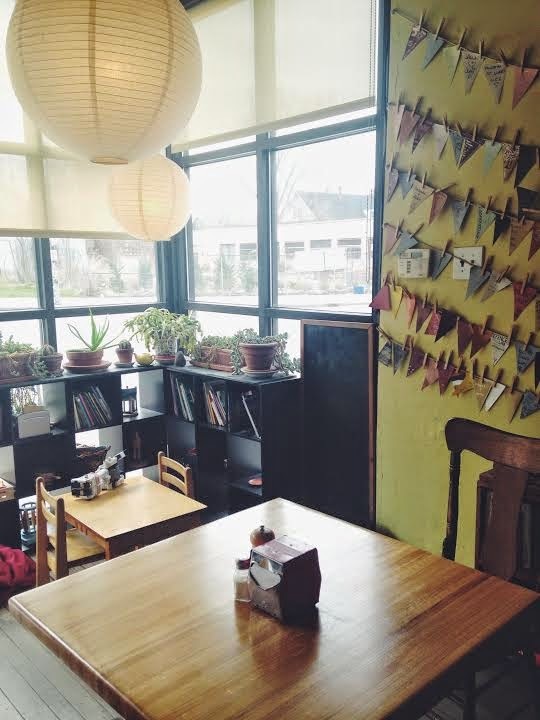 You might ask: What is it about this little toast café and bakery that makes it so unique? Simplicity. Nestled on in Buffalo’s West Side, at 426 Rhode Island St., you’ll find Five Points Bakery next to Urban Roots Community Garden Center. Owners Kevin and Melissa Gardner work with local farmers to produce all their food. You can buy the ingredients they use in production right in the bakery. On their website you can find which farmers they work with and learn more all about the ingredients they use. Husband and wife were previous bakery managers. Melissa Gardner began buying a lot of local products but one thing the couple couldn’t find was any locally produced bread. You could go to Lexington Coop or Luigi’s and get bread that was baked in Buffalo, but the wheat used was still coming from out West. This presented an opportunity for them. The Gardners are a part in the harvesting processes. “We had a wheat harvest that was going to be bad because it was really wet and the wheat heads were going to mold. We had to make a decision to either spray and prevent the mold, or we were going to hope that the weather cleared up and it would dry out. Working with a local farmer, I was able to be part of that decision. We decided to hold off and see what happened. It cleared up thankfully,” said Kevin Gardner. Because of their involvement, they are a big part of their business. Almost completely family operated, their employees consist of their four daughters, Kevin’s brother-in-law, and a previous intern. The tight-knit staff creates the homey atmosphere they envisioned. They make it a point to train their staff to make sincere personal connections with everyone who walks in. Melissa Gardener was in charge of the design principles. If you ask someone who’s been to Five Points, or read Yelp reviews, you will see over and over that people comment on the cozy atmosphere. One one of the walls, rows of paper flags hang on a line with clothespins. There are names written on each one. “At 7/11 they’ll have shamrocks or balloons that you can by to [donate] to a cause. We’re working on a building project across the street and our customers like what we’re doing so we wanted to provide an opportunity for them to help us. We sell the flags for $5 and they get to show their support,” Kevin Gardener said. The Gardners serve a range of customers, from students with laptops to children dragging their parents in so they can go sit and play in the kid’s section.The front corner of the bakery, next to the flag wall, houses a children’s corner with its own mini table and shelf of books and activities. The couple plans to have more family oriented sitting areas when the new location in the near future. For locals, Five Points Bakery has become a diamond in the rough. Ana Sanchez Lopez, middle school teacher at Herman Badillo Bilingual Academy located about six minutes away on Carolina St., recently had breakfast from Five Points for the first time. 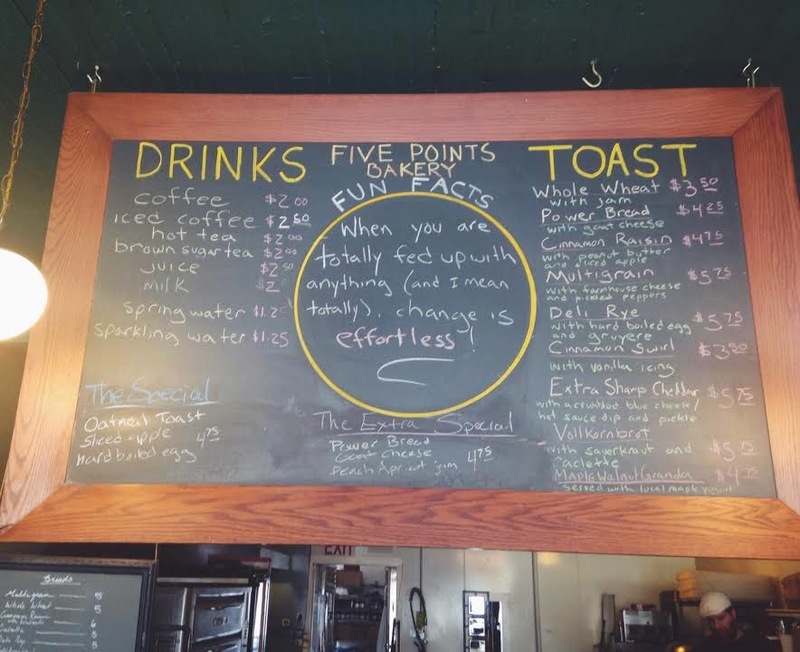 On April 25, Five Points Bakery celebrated its five-year anniversary.